Washington-on-the-Brazos celebrates the 175th anniversary of Texas’ independence. On the pages of hand-sized journals, bound only with thin twine, William Fairfax Gray — a Virginia land agent looking for investment property — penned what he heard and saw as he traveled through Texas in 1836. In late February, he arrived in Washington, a ferry landing on the Brazos River where Texas just days later broke away from Mexico. 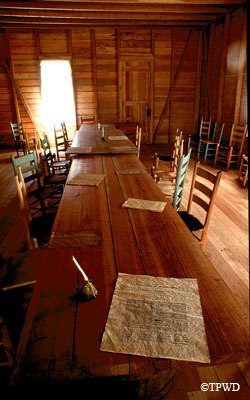 This month, staff and volunteers at Washington-on-the-Brazos State Historic Site will honor the 175th anniversary of those 17 historic days when delegates gathered in an unfinished frame house and hashed out a framework for what would become the Republic of Texas. Like Gray, you can witness who said what and feel the men’s anxiety as they waited for news from the Alamo. Re-enactments of the General Convention will highlight this year’s Texas Independence Day Celebration, set for Feb. 26–27 from 9 a.m. to 5 p.m. Plenty more’s planned, too. At campsites near the river, you can watch soldiers with the Texian army practice military drills and cook meals over open fires. You’ll also find more soldiers camping near the Star of the Republic Museum, which preserves a treasure trove of early Texas culture. Throughout the two days, cannons will boom and muskets will fire in weapons demonstrations and drill competitions. Not far from the visitor center, skilled artisans will embroider intricate designs onto linens, fashion Native American goods from natural materials and forge raw iron into useful tools. Live music will keep toes tapping, and food vendors will offer an array of munchies and drinks. More than 1,000 descendants of the signers of the declaration are expected to attend Sunday’s reunion at the park’s amphitheater. The Big Picture — a huge reproduction of the famous 1936 artwork by Charles and Fanny Normann — will also be unveiled. More than 70 Texas artists painted an assigned segment of the original painting, which depicts delegate George Childress — not Childers — reading the declaration. Like any well-intentioned writer then and now, Gray simply misspelled the name. Washington-on-the-Brazos is off Texas Highway 105 between Brenham and Navasota. For more information, call 936-878-2214 or visit www.tpwd.state.tx.us/washingtononthebrazos.